This is part of my on going look at turbos and the relationship between RPM's and horsepower on RB26 engines. 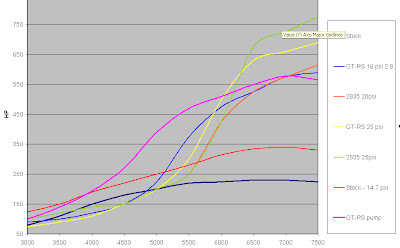 The new line on this chart is GT-RS pump. That is a set of GT-RS turbos on a 2.8 liter RB26. It has what I would call mid sized cams in it. Lots of little tricks to make power. Its setup more as a real street car, so we tried to maximize area under the curve. Its pretty obvious from this chart, that we did just that. One more chart after the jump. Who says GT-RS are bad turbos ? Yes, I do.